Override is absolutely a brawler in the same vein as games like Rivals of Aether, Brawlhalla, or Super Smash Bros, but it also employs a few mechanics that are common to fighters, such as a super meter. It's the kind of game where you can hop in and run around in a giant mech punching other mechs in the face, or decide that you really want to "git gud" and spend time learning the different intricacies to become a Versus champ. This is the best scenario for any kind of brawler; a game that can accommodate players looking for some smashing fun and some smashing competition. As someone who has never spent a lot of time getting way into fighting games, I'll say that I'm not the best person to provide in-depth analysis of the "rock paper scissors" mechanics or how the different mechs are balanced. What I can say is that it's clear the developers have spent time thinking about how to make each of the playable mechs feel different (agile vs heavy, close combat specials vs ranged) and how to provide moves (like the "catch counter") that makes it more than a "button masher." I've already found a couple of mechs that I enjoy playing based on how they move and what their supers do, which is usually where I fall with most fighting games. Of course how comfortable I am with a certain character and how well I can pull off certain moves goes right out the window (in a good way) when friends enter the picture. When running a crew of four, there are a few different way things can go depending on everyone's level of familiarity with the game. You could have complete chaos where your mech would look like some guy just flailing his arms hoping to hit something, or you could have something a little more controlled where players are calling out their moves. In the heat of combat, the latter is certainly a little tougher to pull off, but definitely required if you plan on taking on the more difficult A.I. opponents. Somewhere between the two is probably the real "sweet spot" where the Arm players are coordinating their efforts for when to do quick attacks vs charged vs specials, while the Pilot and Legs are working together to avoid incoming attacks. If you're wondering which method we employed, it's definitely the first one. There are a few quibbles I have with Override. First, the menu interfaces could use some touching up. For instance, there aren't multiple save slots for the Arcade/Campaign so you can't have a game that's just you going on your own and a game where you're playing with friends. Additionally, setting up a match with friends against A.I. bots isn't exactly straightforward, as Mike discussed during our stream. The host has to first choose a mech, then select the number of pilot seats on the mech. Once everyone takes a seat in the mech, then the host can setup A.I. bots. Second, when players all join up on one mech, there doesn't appear to be a way to choose which part they want to control. If there is some sort of system or order to it all, then it should be more obvious so that it doesn't feel so random. If you've been looking for a more modern take on Virtual On, then Override: Mech City Brawl is worth checking out. Best of all, it's not only a great party game with friends, whether they are near or far, but there's plenty to dig into if you're more seriously inclined. 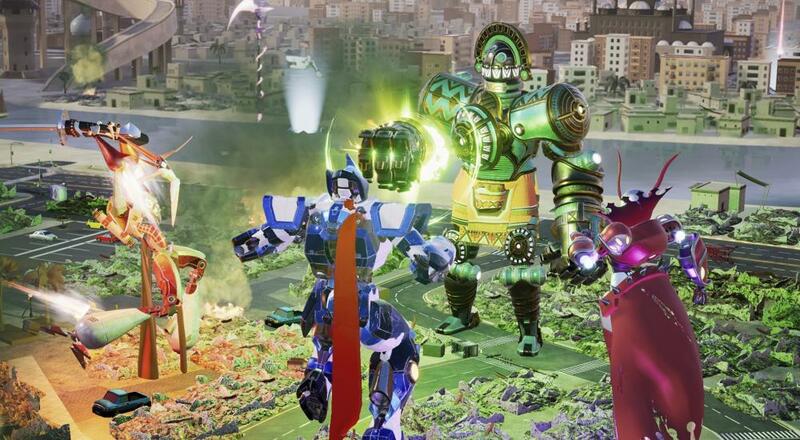 Override: Mech City Brawl is available on PC, Xbox One, and PlayStation 4 for $29.99. Page created in 0.6895 seconds.